I have been reading up on Japanese wood-cut printing and found an e-book version of a 1926 book The Technique of the Color Wood-cut by Walter J. Phillips which was published August 1, 1926, by Brown-Robertson Co. Inc. (New York). 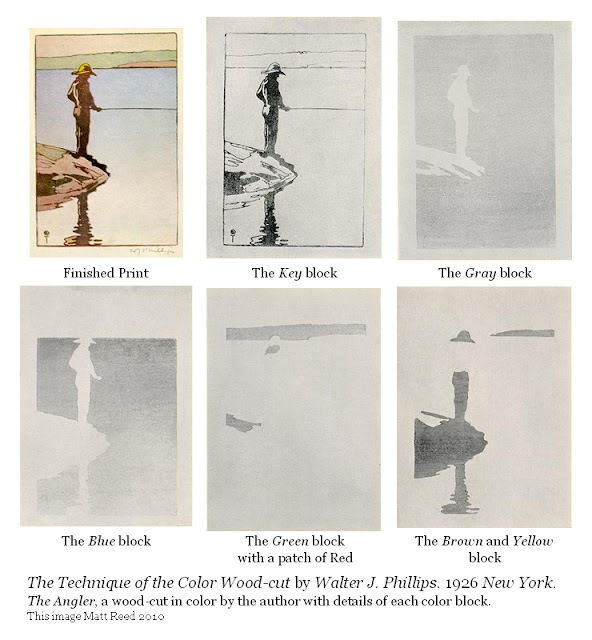 This book, and the website , includes an image of a finished color wood-cut by the author and images of impressions from the wood blocks used for the separate colours. I have used these images to make the following small multiple showing the technique. The book is interesting as it indicates the amount of work that is required after the artist has decided how to make the color separation. Each separate block is a carving job in blocks of Canadian cherry wood and then inking and printing.